I might not trust the foul-mouthed, opinionated, and often incendiary celebrity chef Anthony Bourdain to spend an afternoon playing mahjong with my grandma and her retirement home homies. But I definitely trust him with my food. In this recent video by Tech Insider, Bourdain lays down the law in regards to everyone's favorite comfort meat-sandwich: the burger. So chisel these lessons into a stone tablet (pretty sure they sell those at Home Depot) and hammer them into your lawn, next to your grill. Or just... you know, bookmark this article on your phone. Whatever's easier for you. Before doing anything to your burger, Bourdain suggests taking a quick step back to ask yourself, are you really making this classic dish better? "You might deconstruct it in a way that impresses people or delights them, or astounds them. But does it make it better?" he asks. The first key to a perfect burger is keeping it simple, and not getting caught up in unnecessary flair or complications. Thou shall use "a hunk of well-ground, good-quality Beef"
If it doesn't melt, you don't want it near your burger. 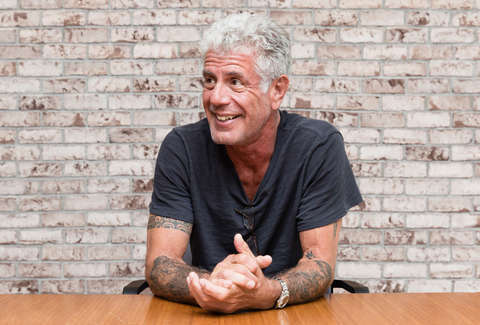 "I like lettuce on a burger, maybe even a tomato is nice," Bourdain says. "But it makes it more structurally difficult to eat." Is the trade-off worth it? Well, in Bourdain's perfect culinary world, you should be able to eat a burger "with one hand," no exceptions. The "commuting cheeseburger" needs to become a thing, right? 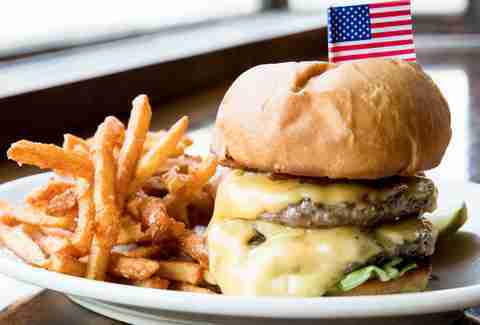 In addition to having ingredients conducive to one-hand eating, the burger also needs to be balanced: You want each bite to contain all of the elements of the burger. "There's a tectonic slide that occurs when you start to overcomplicate and add other products," he says, referring to the slip-and-slide of greasy ingredients on most burgers' surfaces. This is where you end up with an ultimate bite made up entirely of meat, bun, or -- God forbid -- pickle. You don't want any of that. "Personally, I approve of ketchup on a burger, mayonnaise if you insist, but beyond that you have to ask again, 'Am I making it better?'" Bourdain asks viewers, who begrudgingly put their Sriracha, BBQ sauce, ranch, and Good Burger special sauce back in their fridges. "You know, a burger is a beautiful thing. It's not beautiful when you are wearing half of it," Bourdain says. Adult bibs need to make a comeback. Are you making this burger better by adding bacon? In Bourdain's mind... maybe. In Bourdain's esteemed opinion, introducing bacon to a burger is as much an engineering and structural issue as it is a flavor enhancer. Does the bacon throw off the balance? Does it make the burger messy? Is there bacon in all -- or at least most -- bites? Will one of those piping-hot strips end up plastered on the front of your new white cable-knit sweater? Again -- simple is better, and you don't want to push your luck. Overall, the final rule encapsulates almost every lesson Bourdain lays on the line in the name of burgers: This is his golden rule. "One of the greatest sins in 'burgerdom,' I think, is making a burger that is difficult to eat. Where the bread-to-meat ratio is out of whack. Where it's either too greasy or not greasy enough. Or the damn thing just doesn't hold together the way God intended burgers to hold together."